Santa Fe is a singular city with a wealth of cultural charm. It regularly attracts tourists from across the country. Many come to witness its historic downtown and while there are many accommodations throughout the city, the Hilton of Santa Fe, located at Santa Fe Historic Plaza is clearly one of the most revered. Situated in a 300-year-old hacienda, the hotel boasts a rich historic appeal, making it one of the most unique hotels in the Santa Fe area. Aside from its obvious historic appeal, modern amenities complement the hotel for a great balance. If you are traveling to Santa Fe, you may just want to book yourself a room in this enchanting hotel. 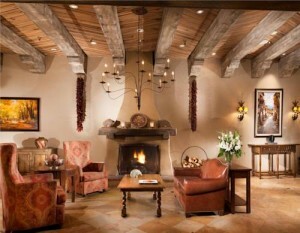 One of the great features about the Santa Fe Hilton is that it exudes Southwestern décor and style. Public areas, in particular, are designed with features that celebrate Southwestern design. Adobe colored walls and Native American art complement sumptuous furnishings. The hotel’s rooms are richly decorated and furnished with every comfort in mind. The hotel’s suites feature adobe walls, kitchens, and kiva fireplaces. If you’re planning to spend any time in Santa Fe, you’ll enjoy being surrounded by the stylish decorative elements of the Hilton. The hotel features both business and recreational amenities. 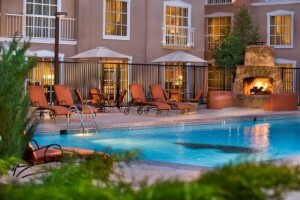 To better enjoy the Santa Fe sunshine, hotel guests love to spend time poolside. The hotel’s pool area is designed much like an outdoor room. Comfortable seating and an outdoor Kiva fireplace make this a lovely setting to enjoy with family or friends. 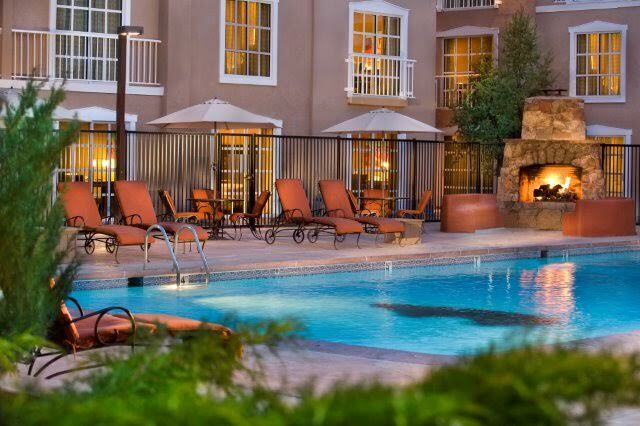 The Hilton Santa Fe also boasts a state-of-the-art fitness center. If you’re traveling with children, be sure to check out the hotel’s menu of great children’s activities. The Santa Fe Hilton features in-room dining as well as the celebrated El Canon Restaurant and Bar (serving breakfast, lunch, and dinner) and the Pinon Grill, a popular breakfast spot. Enjoy great food with plenty of Southwestern flavor. Of course, Santa Fe has many fine eateries, but El Canon attracts even the locals with its style and delicious cuisine. 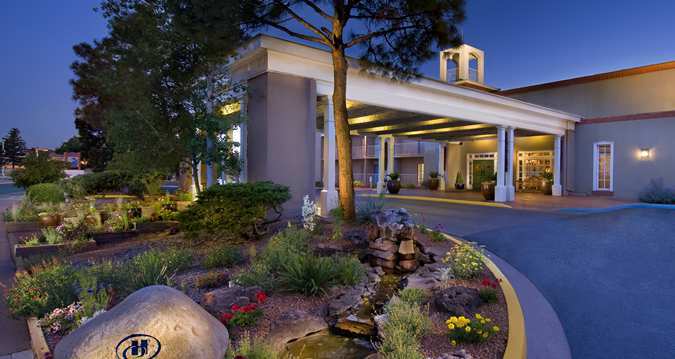 Situated in Santa Fe’s Historic Plaza, the Santa Fe Hilton is just ten miles from the Santa Fe Municipal Airport and within easy distance of many area attractions like Museum Hill, Lensic Theatre, shops, restaurants, and cafes. Guests of the Hilton often enjoy exploring the Historic Plaza. Many visitors to Santa Fe also enjoy skiing in the vicinity or playing golf. 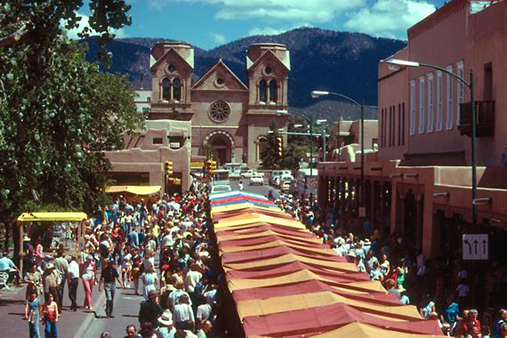 Of course, there are lots of things to see and do in Santa Fe from riding balloons to checking out world-famous museums like the Georgia O’Keefe Museum. The Santa Fe Hilton is a wonderful place to hang your hat when you’re visiting this iconic New Mexico city. Comfortable in every respect, the hotel lives up to the Hilton name, yet also has its own special style which sets it apart from other hotels. Visit the Santa Fe Hilton’s website to learn more about its many fine features or to make reservations. Whether you’re traveling on business or pleasure, this historic hacienda-style hotel will surely satisfy your expectations. Stay up to date with articles like this at Hooked on Travelling. 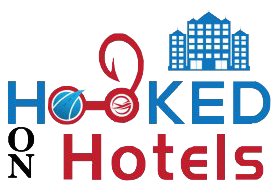 To get #hookedon everything, subscribe to Hooked On Everything today! It is my appropriate time to make some plans for the future and it’s time to be happy. I always wanted to go here!! the roof pool looks amazing.thanks for beautiful writing you really helped me to keep this place in my list!!! WaO!!! This is just amazing and so your article keep posting more this is just interesting ,reading about the place prior a visit!! ahead and give you a shout out! Juust wanted to saay keep upp the excellent job! 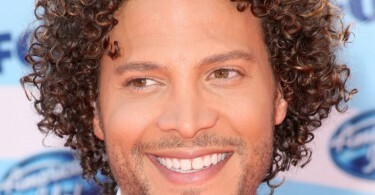 terrific blog!! my friends were there last year and so iam I planning to visit there !! thanks for elaborating the things prior to visit it was great!! wao this place looks so southern style from inside thanks for valuable information it was so fun reading!! had a feeling of a visit There. So impressed with these articles its so clear and positive view on such places where you want to spend big bolt of money. Iam really loving your work and asking my friends to visit this website… Great blog! This looks so nice. Thanks for all the info you provided. Definitely a great place to check out.